your journey if the fluid level has fallen below the MIN marking » Fig. 130 on page 146 - there is a risk of an accident. Seek help from a specialist garage. Do not use used brake fluid - the function of the brake system may be impaired – there is the risk of an accident. Brake fluid damages the paintwork of the vehicle. The brake fluid is changed as part of a prescribed inspection service. We recommend using oils from the ŠKODA Original Accessories range. 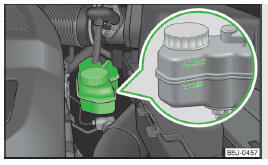 The brake fluid reservoir is located in the engine compartment » Fig. 130. Check the level of brake fluid in the reservoir » Fig. 130. The level must be between the “MIN” and “MAX” markings. A slight drop in the fluid level results in operation due to normal wear and tear and the automatic adjustment of the brake pads. There may be an indication of a leak in the brake system, however, if the fluid level drops significantly within a short time or if it drops below the “MIN” marking. Brake fluid absorbs moisture. Over time it therefore absorbs moisture from the environment. Excessive water in the brake fluid may be the cause of corrosion in the brake system. The water content lowers the boiling point of the brake fluid.